" In 1984 Dave Hibberd organised a residency for a trio to play in the “Plough”, Bedminster, Bristol . This comprised himself on drums and vocals, Geoff Miller on bass and Dave Collett on piano and vocals. Each of these were playing concurrently with other bands but agreed to reserve Tuesdays for the Plough. The pub was run by Pauline and Des who were very supportive. Although it was all his idea, Dave Hibberd decided that the group would be called the Dave Collett trio. Either through modesty or a desire to keep out of the lime-light. 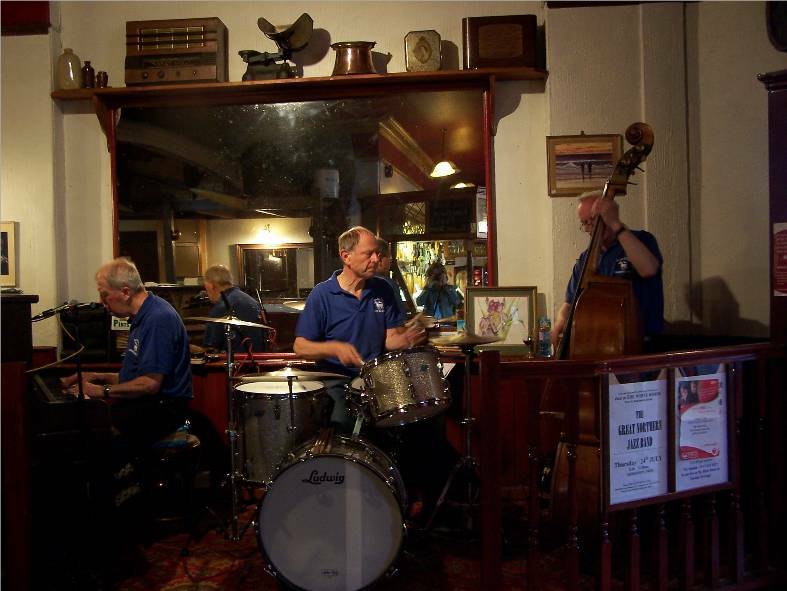 The trio played a mixture of standards, boogie, blues and originals. Besides being a swinging drummer , Dave Hibberd could sing in the Sinatra style while Dave Collett sang more blues and originals. This is a generalisation and both crossed over from time to time. This was a successful formula and the repertoire was changed each week, so that nothing was repeated within 3 weeks. Perhaps because of this, attendances were good and the trip played unchanged at the Plough for 10 years. Then, after several mangers there was a hassle with the music licence and music at the Plough came to an end. After some months Dave Hibberd negotiated another residency. This was at the White Horse, West St, Bedminster run by Dave and Leslie Franklin who gave enthusiastic support. This turned out to be an even better venue than the Plough and the Trio played there unchanged for the next 12 or so years. Then Geoff Miller decided to retire and was replaced by Maurice Everson; a great bassist. Also at around this time, Dave and Leslie Franklin retired. Dave Hibberd, who started the whole thing off, retired through ill health. He had been unwell for some time. His place was filled for a time by Frank Woodford (who had played all Dave’s recent outside gigs) but found tuesdays difficult. The regular drummer is now Bob Watkins. He also sings and this restores the original format of the Trio. So that comes to 24 years; say 1200 gigs. Not bad for just three blokes." (Note from webmaster: THE WHITE HORSE closed as a venue in 2011, and the Trio then moved to the newly re-opened PLUME OF FEATHERS pub at 135 Hotwell Road, Hotwells, Bristol, BS8 4RU run by supportive managers Diarmuid and Laura. When this venue ended the Trio found a home at the THE ORCHARD, Hanover Place, Bristol, BS1 6XT where they played successfully for 2 to 3 years until Dave Collett decided to retire from regular playing in June 2017 due to ill health. In 1998 a book was published (Dave Collett Blues) featuring words and music of 15 of Dave’s original songs. This was followed by a cassette of these songs which has since been issued on CD. Another CD was issued of the Trio playing a concert at Thurloxton in Somerset in 2006. This was entitled “Down the Road Apiece”. Listen to the track "Summerset" from this CD.